Kintra Foods Organic Rooibos Chai is made with exotic chai spices from Asia that is widely known for its rich aroma and healing qualities. Rooibos means ï¿½red bushï¿½ and is naturally rich in antioxidants and contains essential minerals such as calcium, zinc, and iron. Completely 100% caffeine free, enjoy Rooibos Chai any time of the day by simply adding a tea bag into your cup and pouring hot water into it. Enjoy a Zen moment each and every time with the rich and spicy taste of rooibos chai. 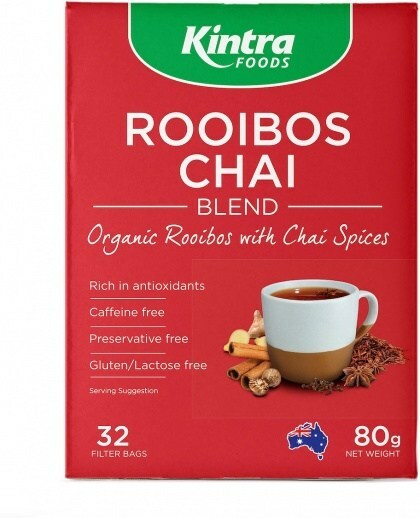 Ingredients: Certified organic rooibos chai.